Posted By PA Breast Cancer Coalition on December 20th, 2010 at 9:40 am | 960 comments. You might think working at a non-profit which deals with a horrible disease like breast cancer would be pretty sobering. While that can be true some days, for example when we heard of the untimely death of Elizabeth Edwards this week, most days at the PBCC are full of fun and laughter. One example of this is our annual staff photo. Since we hire a great professional photographer to capture the events of our October conference on film (boy, isn’t that phrase out-of-date now that we all use digital cameras!) we use that opportunity to have a staff photo taken. Here is the one we had taken this year. Another fun time is our weekly staff meeting. Not a meeting goes by that we don’t diverge off into some crazy tangent for a few minutes. And getting us back on track can sometimes be a chore! We also have assigned tasks each week. One of us is in charge of inspiration – reading some heartwarming quote or story to the group. Someone else provides a word of the day which we all try to work into the meeting. Our competitiveness sometimes comes out and things can get a little crazy. Imagine trying to use the words “soporific”, “perspicacious” or “bloviate” in casual conversation! And another staffer shares some sort of tip, which could be a book or movie recommendation, a favorite recipe, some work-related advice or even just life lessons. Some past tips included ways to winterize your home, how to create an edible snack bowl out of Chex Mix, and how to survive a nuclear attack. As you can imagine, our meetings often devolve into howls of laughter. I feel so blessed and grateful to work in an office where laughter, fun and smiles are the norm. I get to meet such special people in the breast cancer community and I get to work in a fun, relaxed office atmosphere. What more could I want? Posted By Dolores on December 17th, 2010 at 10:10 am | 304 comments. When a newly-diagnosed women or a friend orders one of our FREE Friends Like Me care packages, he or she may request a phone call from our Patient Advocate (that’d be me). We have often thought that the contents of the package may answer many of her questions, so we allow some time for her to receive and review it before I call. This week we learned just how true that is. I called a woman in Wayne County who received her package after Thanksgiving. She is quite an advocate in her own path to treatment and recovery. She has been researching prescription assistance programs and other community resources. When we were just about to end our conversation, she mentioned that part of her education was to read our insurance guidebook Breast Cancer: Covered or Not?, which was included in her Friends Like Me care package. Of particular interest to her was the information on pages 102 and 103 about checking for hospital billing mistakes. So she took out her stack of mounting medical bills and sure enough…there was a double billing mistake to the tune of $10,000! Her hospital acknowledges the mistake and is working to correct it. When she said “Your organization has already saved me $10,000,” it really made our day. If you or someone you know can use advice in relation to breast cancer treatment and insurance, order your FREE copy of Breast Cancer: Covered or Not? today! You can also request a Friends Like Me care package be sent to a recently diagnosed woman in Pennsylvania! Posted By PA Breast Cancer Coalition on December 16th, 2010 at 9:02 am | 131 comments. There are a few people on my holiday gift list that are impossible to buy for. They either have everything they could possibly need, they never give me any gift ideas, or simply are scrooges who don’t like anything no matter what I get! I’m sure you have a few of these people on your list. Well, I have the perfect gift for those hard-to-buy-for friends and family members….a donation to the PA Breast Cancer Coalition in their honor. It’s so easy to do. Head over to our donation page, make your secure online donation, and let us know the name and address of the person in whose name you’re donating. We will send you a thank you letter which can be used as a tax receipt, and we’ll also send the honoree a note explaining that you gave a gift to us in their honor. If you’d rather let them know about the donation yourself, we can send their note to you instead, so you can wrap it and hand it to the person at your holiday get-together. Simply let us know that in the comments section of the donation form. How easy is that? And who wouldn’t appreciate the idea that you made a donation in their name to the PBCC, THE source of breast cancer information and advocacy in Pennsylvania? Who wouldn’t feel proud knowing a donation was made in their honor to help the PBCC represent, support and serve breast cancer survivors and their families all across the state? Who wouldn’t love the idea that a holiday gift was made in their name to find a cure for breast cancer now…so our daughters won’t have to? Help us continue our mission and programs while checking that difficult-to-buy-for person off your shopping list! Thanks and Happy Holidays to you and yours! Posted By PA Breast Cancer Coalition on December 14th, 2010 at 4:09 pm | 52 comments. With the holiday season here and the white stuff flying from the sky, 2011 is knocking on our door. Many take time off from work or school to spend time with family and friends during this time. The staff at the PA Breast Cancer Coalition (PBCC) also spends time with their loved ones, but we always think about those who may have something else on their mind. Breast cancer doesn’t take time off for the holiday or even a coffee break. 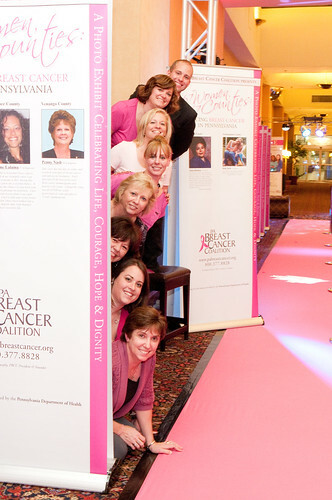 When you gather with your loved ones to celebrate the end of 2010 and the start of a new year, consider paying-it-forward to the women and families in Pennsylvania who are battling breast cancer. Without the support of individuals like you, the PBCC wouldn’t be able to offer educational programming, advocate for legislation, or offer many of the patient resources available to new or recently diagnosed women. Georgette Williams, a three year breast cancer survivor, has taken a stand and asked you to help the 103,000 women living with breast cancer in Pennsylvania. Check out Georgette’s brief comments and consider a gift to the PA Breast Cancer Coalition today.